Geoff Kretchmer and Brian Siegel know how to get the party started. As long-time pals and business partners, they are the friendly faces and brilliant minds behind Star Trax Event Productions and Local Kitchen & Bar in downtown Ferndale. Kretchmer is the service expert — he trains his staff with a gentle, yet firm approach, while Siegel complements him as the creative guru, zoning in on every aesthetic detail. With much success as partners, the dynamic duo have always dreamt up new ways to expand their culinary horizons. Their latest project became the transformation of Local Kitchen. “We had some good years at Local — we love the venue, but it wasn’t the neighborhood hangout we wanted it to be,” Kretchmer said. After several years of brainstorming sessions, the two decided to take action, giving the restaurant an entire makeover. Siegel and Kretchmer’s latest development, The Corner Grill, Bar & Game Room and Detroit Axe came to life on Dec. 11. The action-packed venue not only consists of food, drinks and games, but also offers authentic axe-throwing lanes. 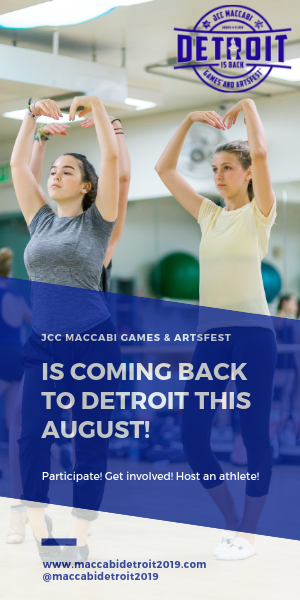 Both Siegel, CEO of the Jewish Community Center of Metropolitan Detroit, and Kretchmer became fascinated with axe throwing when a trusted colleague recommended a live throwing competition in Canada. Siegel and Kretchmer booked a trip to London, Ontario, to watch one of the original axe-throwing organizations, the Backyard Axe Throwing League. “Within five minutes, we fell completely in love,” Kretchmer said. 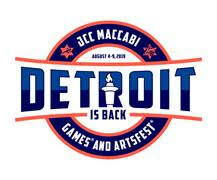 After observing a few rounds, both Kretchmer and Siegel were determined to bring this exciting sport to Metro Detroit. “Between the competitiveness, the interactive nature of it, and the ability to actually do it, we know it’s an appropriate fit,” he added. Axe throwing is surprisingly safe and easy to learn — you don’t need to be a natural-born athlete to succeed. Two participants on opposing teams throw simultaneously, standing about 12 feet from a rectangular board with a target painted in the center. Individuals score points by landing the axe within the target. As a safety measure, lanes are divided by wire fencing, and players on opposing teams throw and retrieve their axes simultaneously. Teammates waiting their turn are encouraged to stand at a reasonable distance and are not to interfere with the players. 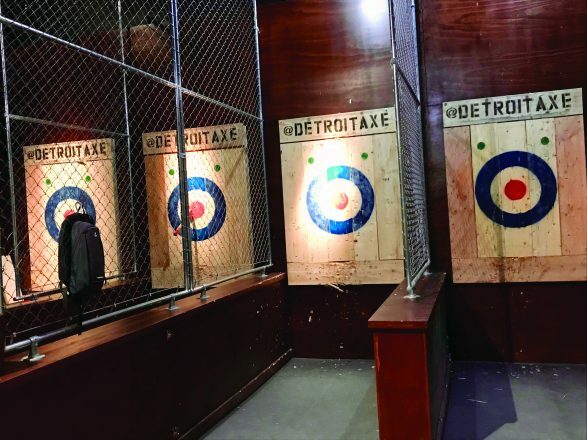 Detroit Axe is located on the upper level of the venue and is essentially the first spot in the metro area fully committed to the sport. At all 12 lanes, guests are assisted by an “Axemaster,” who explains the rules, demonstrates proper technique and provides guidance throughout the game. Alcohol use is kept to a strict minimum while axe throwing, and rowdy guests are not allowed to participate. Detroit Axe patrons have access to a full-service bar and The Corner’s food menu. For those who need to rest their throwing arm, an interactive photo booth and several throwback arcade games are available as well. On the main level, guests will find The Corner Grill, Bar & Game Room. The 54-seat restaurant features wood-finished tables designed by Ron Rea of Michigan-based Ron & Roman. Diners can even dine while cozying up on the sofas surrounding the fireplace. The menu features a wide selection of upscale, casual dishes developed by Siegel, Kretchmer, General Manager Ric Jewel, and experienced Chef Consultants Jeremy Kalmus and Travis Waynick. 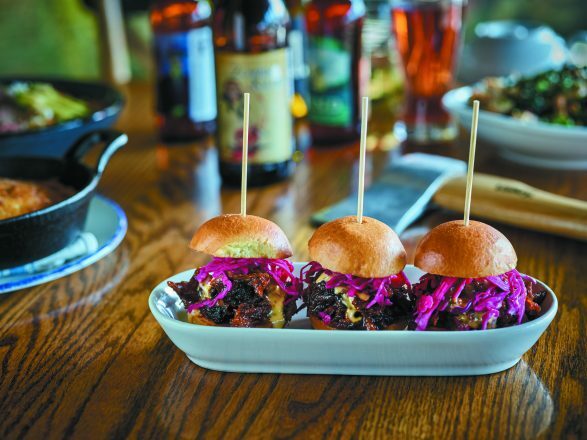 The group collaborated on several shareable plates featuring comforting dishes like the Smoked Brisket Sliders and the decadent Cornbread Skillet. In addition to tempting sandwiches and salads, the menu also features vegetarian and vegan-friendly options, like the Charred Cauliflower Pita with Halloumi cheese and the Vegetarian Mushroom Burger topped with a charred onion aioli. The Corner boasts reasonable prices, with apps and main dishes falling in the $9-$12 range, and a few heartier entrees like the ribeye and trout between $18-$24. For dessert or a late-night snack, diners can indulge in customizable mini-donuts made fresh before their eyes. A substantial bar is central to the space, seating up to 27 guests. Surrounding it are high-top tables placed conveniently near a massive shelf filled with more than 1,000 board games. Whether you’re a fan of Scrabble or more intrigued by strategy games like Catan, the Game Room has it all. 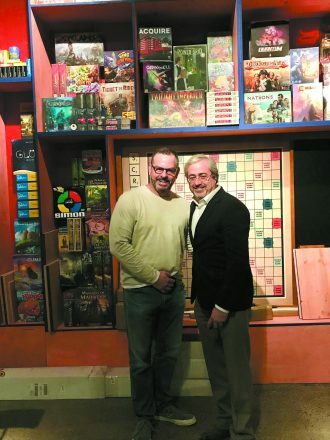 With board game “sommeliers” readily available to make suggestions, groups are bound to find a new favorite. Bartenders are also in on the game-time fun, casually inviting patrons for a round of Jenga or Boggle when the mood strikes. Visitors can indulge in any of the three concepts or sample a bit of each over the course of an evening. Detroit Axe and The Corner Grill, Bar & Game Room offer a novel variety of entertainment and menu selections. “We’ve got some really special dishes that we think will make an impact, and we have a special activity that will ‘wow’ people,” Kretchmer said. With a cutting-edge concept, Detroit Axe and The Corner definitely hit the target. Reservations are recommended for Detroit Axe (a minimum of six players is required/ages 14+). Reservations can be made online at detroitaxe.com. Parties of 36+ are required to call for further booking information at (248) 291-5650. Reservations The Corner Grill, Bar & Game Room can be made by calling or through the website/OpenTable. ← Hollywood Celebrity Jews, News, Movies and more….